For the journal, see Neuroscience (journal). "Brain science" redirects here. For other aspects of brain science, see cognitive science, cognitive psychology, neurology, and neuropsychology. Neuroscience (or neurobiology) is the scientific study of the nervous system. It is a multidisciplinary branch of biology that combines physiology, anatomy, molecular biology, developmental biology, cytology, mathematical modeling and psychology to understand the fundamental and emergent properties of neurons and neural circuits. The understanding of the biological basis of learning, memory, behavior, perception, and consciousness has been described by Eric Kandel as the "ultimate challenge" of the biological sciences. The scope of neuroscience has broadened over time to include different approaches used to study the nervous system at different scales and the techniques used by neuroscientists have expanded enormously, from molecular and cellular studies of individual neurons to imaging of sensory, motor and cognitive tasks in the brain. The earliest study of the nervous system dates to ancient Egypt. Trepanation, the surgical practice of either drilling or scraping a hole into the skull for the purpose of curing headaches or mental disorders, or relieving cranial pressure, was first recorded during the Neolithic period. Manuscripts dating to 1700 BC indicate that the Egyptians had some knowledge about symptoms of brain damage. Early views on the function of the brain regarded it to be a "cranial stuffing" of sorts. In Egypt, from the late Middle Kingdom onwards, the brain was regularly removed in preparation for mummification. It was believed at the time that the heart was the seat of intelligence. According to Herodotus, the first step of mummification was to "take a crooked piece of iron, and with it draw out the brain through the nostrils, thus getting rid of a portion, while the skull is cleared of the rest by rinsing with drugs." The view that the heart was the source of consciousness was not challenged until the time of the Greek physician Hippocrates. He believed that the brain was not only involved with sensation—since most specialized organs (e.g., eyes, ears, tongue) are located in the head near the brain—but was also the seat of intelligence. Plato also speculated that the brain was the seat of the rational part of the soul. Aristotle, however, believed the heart was the center of intelligence and that the brain regulated the amount of heat from the heart. This view was generally accepted until the Roman physician Galen, a follower of Hippocrates and physician to Roman gladiators, observed that his patients lost their mental faculties when they had sustained damage to their brains. Abulcasis, Averroes, Avicenna, Avenzoar, and Maimonides, active in the Medieval Muslim world, described a number of medical problems related to the brain. In Renaissance Europe, Vesalius (1514–1564), René Descartes (1596–1650), Thomas Willis (1621–1675) and Jan Swammerdam (1637–1680) also made several contributions to neuroscience. Luigi Galvani's pioneering work in the late 1700s set the stage for studying the electrical excitability of muscles and neurons. In the first half of the 19th century, Jean Pierre Flourens pioneered the experimental method of carrying out localized lesions of the brain in living animals describing their effects on motricity, sensibility and behavior. In 1843 Emil du Bois-Reymond demonstrated the electrical nature of the nerve signal, whose speed Hermann von Helmholtz proceeded to measure, and in 1875 Richard Caton found electrical phenomena in the cerebral hemispheres of rabbits and monkeys. Adolf Beck published in 1890 similar observations of spontaneous electrical activity of the brain of rabbits and dogs. Studies of the brain became more sophisticated after the invention of the microscope and the development of a staining procedure by Camillo Golgi during the late 1890s. The procedure used a silver chromate salt to reveal the intricate structures of individual neurons. His technique was used by Santiago Ramón y Cajal and led to the formation of the neuron doctrine, the hypothesis that the functional unit of the brain is the neuron. Golgi and Ramón y Cajal shared the Nobel Prize in Physiology or Medicine in 1906 for their extensive observations, descriptions, and categorizations of neurons throughout the brain. In parallel with this research, work with brain-damaged patients by Paul Broca suggested that certain regions of the brain were responsible for certain functions. At the time, Broca's findings were seen as a confirmation of Franz Joseph Gall's theory that language was localized and that certain psychological functions were localized in specific areas of the cerebral cortex. The localization of function hypothesis was supported by observations of epileptic patients conducted by John Hughlings Jackson, who correctly inferred the organization of the motor cortex by watching the progression of seizures through the body. Carl Wernicke further developed the theory of the specialization of specific brain structures in language comprehension and production. Modern research through neuroimaging techniques, still uses the Brodmann cerebral cytoarchitectonic map (referring to study of cell structure) anatomical definitions from this era in continuing to show that distinct areas of the cortex are activated in the execution of specific tasks. During the 20th century, neuroscience began to be recognized as a distinct academic discipline in its own right, rather than as studies of the nervous system within other disciplines. Eric Kandel and collaborators have cited David Rioch, Francis O. Schmitt, and Stephen Kuffler as having played critical roles in establishing the field. Rioch originated the integration of basic anatomical and physiological research with clinical psychiatry at the Walter Reed Army Institute of Research, starting in the 1950s. During the same period, Schmitt established a neuroscience research program within the Biology Department at the Massachusetts Institute of Technology, bringing together biology, chemistry, physics, and mathematics. The first freestanding neuroscience department (then called Psychobiology) was founded in 1964 at the University of California, Irvine by James L. McGaugh. This was followed by the Department of Neurobiology at Harvard Medical School which was founded in 1966 by Stephen Kuffler. The understanding of neurons and of nervous system function became increasingly precise and molecular during the 20th century. For example, in 1952, Alan Lloyd Hodgkin and Andrew Huxley presented a mathematical model for transmission of electrical signals in neurons of the giant axon of a squid, which they called "action potentials", and how they are initiated and propagated, known as the Hodgkin–Huxley model. In 1961–1962, Richard FitzHugh and J. Nagumo simplified Hodgkin–Huxley, in what is called the FitzHugh–Nagumo model. In 1962, Bernard Katz modeled neurotransmission across the space between neurons known as synapses. Beginning in 1966, Eric Kandel and collaborators examined biochemical changes in neurons associated with learning and memory storage in Aplysia. In 1981 Catherine Morris and Harold Lecar combined these models in the Morris–Lecar model. Such increasingly quantitative work gave rise to numerous biological neuron models. As a result of the increasing interest about the nervous system, several prominent neuroscience organizations have been formed to provide a forum to all neuroscientist during the 20th century. For example, the International Brain Research Organization was founded in 1960, the International Society for Neurochemistry in 1963, the European Brain and Behaviour Society in 1968, and the Society for Neuroscience in 1969. Recently, the application of neuroscience research results has also given rise to applied disciplines as neuroeconomics, neuroeducation, neuroethics, and neurolaw. The scientific study of the nervous system increased significantly during the second half of the twentieth century, principally due to advances in molecular biology, electrophysiology, and computational neuroscience. This has allowed neuroscientists to study the nervous system in all its aspects: how it is structured, how it works, how it develops, how it malfunctions, and how it can be changed. For example, it has become possible to understand, in much detail, the complex processes occurring within a single neuron. Neurons are cells specialized for communication. They are able to communicate with neurons and other cell types through specialized junctions called synapses, at which electrical or electrochemical signals can be transmitted from one cell to another. Many neurons extrude a long thin filament of axoplasm called an axon, which may extend to distant parts of the body and are capable of rapidly carrying electrical signals, influencing the activity of other neurons, muscles, or glands at their termination points. A nervous system emerges from the assemblage of neurons that are connected to each other. In vertebrates, the nervous system can be split into two parts, the central nervous system (which is defined as the brain and spinal cord), and the peripheral nervous system. In many species — including all vertebrates — the nervous system is the most complex organ system in the body, with most of the complexity residing in the brain. The human brain alone contains around one hundred billion neurons and one hundred trillion synapses; it consists of thousands of distinguishable substructures, connected to each other in synaptic networks whose intricacies have only begun to be unraveled. At least one out of three of the approximately 20,000 genes belonging to the human genome is expressed mainly in the brain. Due to the plasticity of the human brain, the structure of its synapses and their resulting functions change throughout life. Thus the challenge of making sense of all this complexity is formidable. 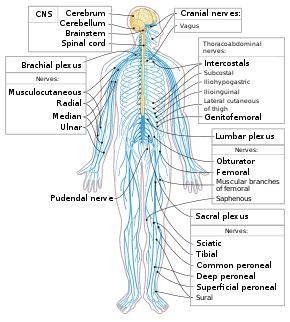 The study of the nervous system is done at multiple levels, ranging from the molecular and cellular levels to the systems and cognitive levels. At the molecular level, the basic questions addressed in molecular neuroscience include the mechanisms by which neurons express and respond to molecular signals and how axons form complex connectivity patterns. At this level, tools from molecular biology and genetics are used to understand how neurons develop and how genetic changes affect biological functions. The morphology, molecular identity, and physiological characteristics of neurons and how they relate to different types of behavior are also of considerable interest. The fundamental questions addressed in cellular neuroscience include the mechanisms of how neurons process signals physiologically and electrochemically. These questions include how signals are processed by neurites – thin extensions from a neuronal cell body, consisting of dendrites (specialized to receive synaptic inputs from other neurons) and axons (specialized to conduct nerve impulses called action potentials) – and somas (the cell bodies of the neurons containing the nucleus), and how neurotransmitters and electrical signals are used to process information in a neuron. Another major area of neuroscience is directed at investigations of the development of the nervous system. These questions include the patterning and regionalization of the nervous system, neural stem cells, differentiation of neurons and glia, neuronal migration, axonal and dendritic development, trophic interactions, and synapse formation. Computational neurogenetic modeling is concerned with the development of dynamic neuronal models for modeling brain functions with respect to genes and dynamic interactions between genes. The questions addressed in systems neuroscience include how neural circuits are formed and used anatomically and physiologically to produce functions such as reflexes, multisensory integration, motor coordination, circadian rhythms, emotional responses, learning, and memory. In other words, they address how these neural circuits function in large scale brain networks, and the mechanisms through which behaviors are generated. For example, systems level analysis addresses questions concerning specific sensory and motor modalities: how does vision work? How do songbirds learn new songs and bats localize with ultrasound? How does the somatosensory system process tactile information? The related fields of neuroethology and neuropsychology address the question of how neural substrates underlie specific animal and human behaviors. Neuroendocrinology and psychoneuroimmunology examine interactions between the nervous system and the endocrine and immune systems, respectively. Despite many advancements, the way that networks of neurons perform complex cognitive processes and behaviors is still poorly understood. Cognitive neuroscience addresses the questions of how psychological functions are produced by neural circuitry. The emergence of powerful new measurement techniques such as neuroimaging (e.g., fMRI, PET, SPECT), EEG, MEG, electrophysiology, optogenetics and human genetic analysis combined with sophisticated experimental techniques from cognitive psychology allows neuroscientists and psychologists to address abstract questions such as how cognition and emotion are mapped to specific neural substrates. Although many studies still hold a reductionist stance looking for the neurobiological basis of cognitive phenomena, recent research shows that there is an interesting interplay between neuroscientific findings and conceptual research, soliciting and integrating both perspectives. For example, the neuroscience research on empathy solicited an interesting interdisciplinary debate involving philosophy, psychology and psychopathology. Moreover, the neuroscientific identification of multiple memory systems related to different brain areas has challenged the idea of memory as a literal reproduction of the past, supporting a view of memory as a generative, constructive and dynamic process. Neuroscience is also allied with the social and behavioral sciences as well as nascent interdisciplinary fields such as neuroeconomics, decision theory, social neuroscience, and neuromarketing to address complex questions about interactions of the brain with its environment. A study into consumer responses for example uses EEG to investigate neural correlates associated with narrative transportation into stories about energy efficiency. Ultimately neuroscientists would like to understand every aspect of the nervous system, including how it works, how it develops, how it malfunctions, and how it can be altered or repaired. The specific topics that form the main foci of research change over time, driven by an ever-expanding base of knowledge and the availability of increasingly sophisticated technical methods. Over the long term, improvements in technology have been the primary drivers of progress. Developments in electron microscopy, computers, electronics, functional brain imaging, and most recently genetics and genomics, have all been major drivers of progress. Neurology, psychiatry, neurosurgery, psychosurgery, anesthesiology and pain medicine, neuropathology, neuroradiology, ophthalmology, otolaryngology, clinical neurophysiology, addiction medicine, and sleep medicine are some medical specialties that specifically address the diseases of the nervous system. These terms also refer to clinical disciplines involving diagnosis and treatment of these diseases. Neurology works with diseases of the central and peripheral nervous systems, such as amyotrophic lateral sclerosis (ALS) and stroke, and their medical treatment. Psychiatry focuses on affective, behavioral, cognitive, and perceptual disorders. Anesthesiology focuses on perception of pain, and pharmacologic alteration of consciousness. Neuropathology focuses upon the classification and underlying pathogenic mechanisms of central and peripheral nervous system and muscle diseases, with an emphasis on morphologic, microscopic, and chemically observable alterations. Neurosurgery and psychosurgery work primarily with surgical treatment of diseases of the central and peripheral nervous systems. The boundaries between these specialties have been blurring recently as they are all influenced by basic research in neuroscience. Brain imaging also enables objective, biological insights into mental illness, which can lead to faster diagnosis, more accurate prognosis, and help assess patient progress over time. Integrative neuroscience makes connections across these specialized areas of focus. Modern neuroscience education and research activities can be very roughly categorized into the following major branches, based on the subject and scale of the system in examination as well as distinct experimental or curricular approaches. Individual neuroscientists, however, often work on questions that span several distinct subfields. Affective neuroscience Affective neuroscience is the study of the neural mechanisms involved in emotion, typically through experimentation on animal models. Behavioral neuroscience Behavioral neuroscience (also known as biological psychology, physiological psychology, biopsychology, or psychobiology) is the application of the principles of biology to the study of genetic, physiological, and developmental mechanisms of behavior in humans and non-human animals. Clinical neuroscience The scientific study of the biological mechanisms that underlie the disorders and diseases of the nervous system. Cognitive neuroscience Cognitive neuroscience is the study of the biological mechanisms underlying cognition. Computational neuroscience Computational neuroscience is the theoretical study of the nervous system. Cultural neuroscience Cultural neuroscience is the study of how cultural values, practices and beliefs shape and are shaped by the mind, brain and genes across multiple timescales. Evolutionary neuroscience Evolutionary neuroscience studies the evolution of nervous systems. Molecular neuroscience Molecular neuroscience studies the nervous system with molecular biology, molecular genetics, protein chemistry, and related methodologies. Neural engineering Neural engineering uses engineering techniques to interact with, understand, repair, replace, or enhance neural systems. Neuroanatomy Neuroanatomy the study of the anatomy of nervous systems. Neurochemistry Neurochemistry is the study of how neurochemicals interact and influence the function of neurons. Neuroethology Neuroethology is the study of the neural basis of non-human animals behavior. Neurogastronomy Neurogastronomy is the study of flavor and how it affects sensation, cognition, and memory. Neurogenetics Neurogenetics is the study of the genetical basis of the development and function of the nervous system. Neuroimmunology Neuroimmunology is concerned with the interactions between the nervous and the immune system. Neurophysics Neurophysics deals with the development of physical experimental tools to gain information about the brain. Paleoneurobiology Paleoneurobiology is a field which combines techniques used in paleontology and archeology to study brain evolution, especially that of the human brain. The largest professional neuroscience organization is the Society for Neuroscience (SFN), which is based in the United States but includes many members from other countries. Since its founding in 1969 the SFN has grown steadily: as of 2010 it recorded 40,290 members from 83 different countries. Annual meetings, held each year in a different American city, draw attendance from researchers, postdoctoral fellows, graduate students, and undergraduates, as well as educational institutions, funding agencies, publishers, and hundreds of businesses that supply products used in research. Other major organizations devoted to neuroscience include the International Brain Research Organization (IBRO), which holds its meetings in a country from a different part of the world each year, and the Federation of European Neuroscience Societies (FENS), which holds a meeting in a different European city every two years. FENS comprises a set of 32 national-level organizations, including the British Neuroscience Association, the German Neuroscience Society (Neurowissenschaftliche Gesellschaft), and the French Société des Neurosciences. The first National Honor Society in Neuroscience, Nu Rho Psi, was founded in 2006. In 2013, the BRAIN Initiative was announced in the US. In addition to conducting traditional research in laboratory settings, neuroscientists have also been involved in the promotion of awareness and knowledge about the nervous system among the general public and government officials. Such promotions have been done by both individual neuroscientists and large organizations. For example, individual neuroscientists have promoted neuroscience education among young students by organizing the International Brain Bee, which is an academic competition for high school or secondary school students worldwide. In the United States, large organizations such as the Society for Neuroscience have promoted neuroscience education by developing a primer called Brain Facts, collaborating with public school teachers to develop Neuroscience Core Concepts for K-12 teachers and students, and cosponsoring a campaign with the Dana Foundation called Brain Awareness Week to increase public awareness about the progress and benefits of brain research. In Canada, the CIHR Canadian National Brain Bee is held annually at McMaster University. Neuroscience educators formed Faculty for Undergraduate Neuroscience (FUN) in 1992 to share best practices and provide travel awards for undergraduates presenting at Society for Neuroscience meetings. Finally, neuroscientists have also collaborated with other education experts to study and refine educational techniques to optimize learning among students, an emerging field called educational neuroscience. Federal agencies in the United States, such as the National Institute of Health (NIH) and National Science Foundation (NSF), have also funded research that pertains to best practices in teaching and learning of neuroscience concepts. ^ "Neurobiology". Dictionary.com. Retrieved 2017-01-22. ^ Kandel, Eric R. (2012). Principles of Neural Science, Fifth Edition. McGraw-Hill Education. pp. I. Overall perspective. ISBN 978-0071390118. ^ Ayd, Frank J., Jr. (2000). Lexicon of Psychiatry, Neurology and the Neurosciences. Lippincott, Williams & Wilkins. p. 688. ISBN 978-0781724685. ^ Shulman, Robert G. (2013). "Neuroscience: A Multidisciplinary, Multilevel Field". Brain Imaging: What it Can (and Cannot) Tell Us About Consciousness. Oxford University Press. p. 59. ISBN 9780199838721. ^ Ogawa, Hiroto; Oka, Kotaro (2013). Methods in Neuroethological Research. Springer. p. v. ISBN 9784431543305. ^ Tanner, Kimberly D. (2006-01-01). "Issues in Neuroscience Education: Making Connections". CBE— Life Sciences Education. 5 (2): 85. doi:10.1187/cbe.06-04-0156. ISSN 1931-7913. PMC 1618510. ^ Kandel, Eric R. (2012). Principles of Neural Science, Fifth Edition. McGraw-Hill Education. p. 5. ISBN 978-0071390118. The last frontier of the biological sciences – their ultimate challenge – is to understand the biological basis of consciousness and the mental processes by which we perceive, act, learn, and remember. ^ Mohamed W (2008). "The Edwin Smith Surgical Papyrus: Neuroscience in Ancient Egypt". IBRO History of Neuroscience. Retrieved 2014-07-06. ^ Herodotus (2009) [440 BCE]. The Histories: Book II (Euterpe). Translated by George Rawlinson. ^ Plato (2009) [360 BCE]. Timaeus. Translated by George Rawlinson. ^ Finger, Stanley (2001). Origins of Neuroscience: A History of Explorations into Brain Function (3rd ed.). New York: Oxford University Press, USA. pp. 3–17. ISBN 978-0-19-514694-3. ^ Finkelstein, Gabriel (2013). 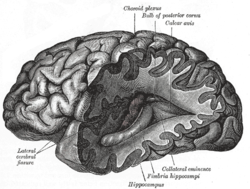 Emil du Bois-Reymond: Neuroscience, Self, and Society in Nineteenth-Century Germany. Cambridge; London: The MIT Press. pp. 72–74, 89–95. ISBN 9780262019507. ^ Harrison, David W. (2015). Brain Asymmetry and Neural Systems Foundations in Clinical Neuroscience and Neuropsychology. Springer International Publishing. pp. 15–16. ISBN 978-3-319-13068-2. ^ "Caton, Richard - The electric currents of the brain". echo.mpiwg-berlin.mpg.de. Retrieved 2018-12-21. ^ Coenen, Anton; Edward Fine; Oksana Zayachkivska (2014). "Adolf Beck: A Forgotten Pioneer In Electroencephalography". Journal of the History of the Neurosciences. 23 (3): 276–286. doi:10.1080/0964704x.2013.867600. PMID 24735457. ^ Guillery, R (Jun 2005). "Observations of synaptic structures: origins of the neuron doctrine and its current status". Philos Trans R Soc Lond B Biol Sci. 360 (1458): 1281–307. doi:10.1098/rstb.2003.1459. PMC 1569502. PMID 16147523. ^ Greenblatt SH (1995). "Phrenology in the science and culture of the 19th century". Neurosurgery. 37 (4): 790–805. doi:10.1227/00006123-199510000-00025. PMID 8559310. ^ Bear MF; Connors BW; Paradiso MA (2001). Neuroscience: Exploring the Brain (2nd ed.). Philadelphia: Lippincott Williams & Wilkins. ISBN 978-0-7817-3944-3. ^ Kandel ER; Schwartz JH; Jessel TM (2000). Principles of Neural Science (4th ed.). New York: McGraw-Hill. ISBN 978-0-8385-7701-1. ^ "History - Department of Neurobiology". ^ "About EBBS". European Brain and Behaviour Society. 2009. Archived from the original on 2016-03-03. ^ "How can neuroscience inform economics?" (PDF). Current Opinion in Behavioral Sciences. ^ "What is Neuroethics?". www.neuroethicssociety.org. Retrieved 2019-02-22. ^ Petoft, Arian (2015-01-05). "Neurolaw: A brief introduction". Iranian Journal of Neurology. 14 (1): 53–58. ISSN 2008-384X. PMC 4395810. PMID 25874060. ^ U.S. National Institute of Neurological Disorders and Stroke. Brain basics: genes at work in the brain. Date last modified: 2018-12-27. Retrieved Feb. 4, 2019. ^ Ofengenden, Tzofit (2014). "Memory formation and belief" (PDF). Dialogues in Philosophy, Mental and Neuro Sciences. 7 (2): 34–44. ^ Gordon, Ross; Ciorciari, Joseph; Van Laer, Tom (2018). "Using EEG to examine the role of attention, working memory, emotion, and imagination in narrative transportation". European Journal of Marketing. 52: 92–117. doi:10.1108/EJM-12-2016-0881. SSRN 2892967. ^ Lepage M (2010). "Research at the Brain Imaging Centre". Douglas Mental Health University Institute. Archived from the original on March 5, 2012. ^ Panksepp J (1990). "A role for "affective neuroscience" in understanding stress: the case of separation distress circuitry". In Puglisi-Allegra S; Oliverio A (eds.). Psychobiology of Stress. Dordrecht, Netherlands: Kluwer Academic. pp. 41–58. ISBN 978-0-7923-0682-5. ^ Chiao, J.Y. & Ambady, N. (2007). Cultural neuroscience: Parsing universality and diversity across levels of analysis. In Kitayama, S. and Cohen, D. (Eds.) Handbook of Cultural Psychology, Guilford Press, New York, pp. 237-254. ^ 1933-, Shepherd, Gordon M. Neurogastronomy : how the brain creates flavor and why it matters. ISBN 9780231159111. OCLC 882238865. ^ "Financial and organizational highlights" (PDF). Society for Neuroscience. Archived from the original (PDF) on September 15, 2012. ^ "About the International Brain Bee". The International Brain Bee. ^ "Brain Facts: A Primer on the Brain and Nervous System". Society for Neuroscience. ^ "Neuroscience Core Concepts: The Essential Principles of Neuroscience". Society for Neuroscience. Archived from the original on April 15, 2012. ^ "Brain Awareness Week Campaign". The Dana Foundation. ^ "Official CIHR Canadian National Brain Bee Website". Archived from the original on May 30, 2014. Retrieved 24 September 2014. ^ Goswami U (2004). "Neuroscience, education and special education". Br J of Spec Educ. 31 (4): 175–183. doi:10.1111/j.0952-3383.2004.00352.x. ^ "The SEPA Program". NIH. Archived from the original on September 20, 2011. Retrieved September 23, 2011. ^ "About Education and Human Resources". NSF. Retrieved September 23, 2011. ^ "The Nobel Prize in Physiology or Medicine 1904". Nobel Foundation. Retrieved 28 July 2007. ^ "The Nobel Prize in Physiology or Medicine 1906". Nobel Foundation. Retrieved 28 July 2007. ^ "The Nobel Prize in Physiology or Medicine 1914". Nobel Foundation. Retrieved 28 July 2007. ^ "The Nobel Prize in Physiology or Medicine 1932". Nobel Foundation. Retrieved 28 July 2007. ^ "The Nobel Prize in Physiology or Medicine 1936". Nobel Foundation. Retrieved 28 July 2007. ^ "The Nobel Prize in Physiology or Medicine 1944". Nobel Foundation. Retrieved 28 July 2007. ^ a b "The Nobel Prize in Physiology or Medicine 1949". Nobel Foundation. Retrieved 28 July 2007. ^ "The Nobel Prize in Physiology or Medicine 1957". Nobel Foundation. Retrieved 28 July 2007. ^ "The Nobel Prize in Physiology or Medicine 1961". Nobel Foundation. Retrieved 28 July 2007. ^ a b "The Nobel Prize in Physiology or Medicine 1970". Nobel Foundation. ^ a b c "The Nobel Prize in Physiology or Medicine 1981". Nobel Foundation. ^ Cite error: The named reference n1997 was invoked but never defined (see the help page). ^ "The Nobel Prize in Physiology or Medicine 2000". Nobel Foundation. Retrieved 28 July 2007. ^ "The Nobel Prize in Chemistry 2003". Nobel Foundation. Retrieved 4 April 2019. ^ "The Nobel Prize in Physiology or Medicine 2014". Nobel Foundation. Retrieved 7 October 2013. Bear, M. F.; B. W. Connors; M. A. Paradiso (2006). Neuroscience: Exploring the Brain (3rd ed.). Philadelphia: Lippincott. ISBN 978-0-7817-6003-4. Binder, Marc D.; Hirokawa, Nobutaka; Windhorst, Uwe, eds. (2009). Encyclopedia of Neuroscience. Springer. ISBN 978-3-540-23735-8. Kandel, ER; Schwartz JH; Jessell TM (2012). Principles of Neural Science (5th ed.). New York: McGraw-Hill. ISBN 978-0-8385-7701-1. Andreasen, Nancy C. (March 4, 2004). Brave New Brain: Conquering Mental Illness in the Era of the Genome. Oxford University Press. ISBN 978-0-19-514509-0. Archived from the original on February 24, 2007. Lauwereyns, Jan (February 2010). The Anatomy of Bias: How Neural Circuits Weigh the Options. Cambridge, Massachusetts: The MIT Press. ISBN 978-0-262-12310-5. Robinson, D. L. (2009). Brain, Mind and Behaviour: A New Perspective on Human Nature (2nd ed.). Dundalk, Ireland: Pontoon Publications. ISBN 978-0-9561812-0-6. Wikimedia Commons has media related to neuroscience.